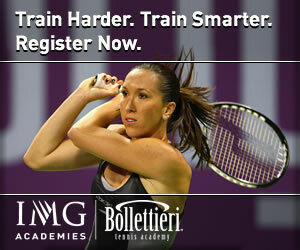 The game of tennis, at least on the pro level, seems to have progressed into a primarily backcourt game. The era of serve/volley seems to have for all intents and purposes disappeared. We even see that those who compete at Wimbledon are able to enjoy success by playing a groundstroke oriented game. With a different grass deliberately planted at this venerable location, we can see that fans enjoy longer rallies associated with the backcourt game. It is my sincere hope, and I would suspect that John McEnroe would agree with me, that serve/volley oriented game styles increase in the singles game. From my perspective, having a wide variety of playing styles is most desirable and entertaining. at least on the pro level. On the recreational and club levels, one can still see serve/volley style of play evident, if only among the more senior competitors. In observing many matches, I have noticed that the modern, groundstroke player is somewhat at a disadvantage when competing against an accomplished serve/volley opponent. This is particularly true among younger competitors. much to the consternation of the more youthful opponent. In watching this match, it became abundantly clear to me that the modern "groundstroker" is often times ill prepared to handle the accomplished serve/volley opponent. Generally speaking, I believe that a primary reason for this dilemma is that the modern groundstroker is not really accustomed to hitting effective passing shots. Once in a while, you will hear someone speak about a player stating, "He or she loves a target." What is meant by this saying is that the player likes to hit passing shots and has an ability to execute these with effectiveness. Well, this months column is going to address the phenomenon of passing shots!!! Okay, you are probably saying to yourself, "But, Ron. If there arent many serve/volley players out there, why are passing shots so essential?" This is logical and well founded question. First, there are more serve/volley players on the recreational and club levels than are found in high school, collegiate and professional competition. In USTA Open competitions, it is not unlikely to find one or two players in the field who are approaching the game with a serve/volley strategy. Second, if you are competing on fast surfaces like grass and many indoor surfaces (especially carpet), you are going to find that the serve/volley players will flock to compete. These surfaces truly favor the net game. In fact, the golden rule when competing on these surfaces may be, "Never let the ball bounce, if you can help it." On faster surfaces, the doubles players will come out to compete in singles in far greater numbers. The doubles game, when played as it should be, necessarily rewards the player who is capable of the serve/volley approach. as does the likelihood of competing on faster surfaces. However, I would argue that even slow surfaces can utilize effective passing shots. The key is to bring your opponent to the net. Given the prevalence of "groundstrokers," it is a very effective tactic to bring the opponent to the net. Generally, the modern opponent is not a great volleyer. When placed in the situation of having to volley, rather than choosing to volley, the modern competitor is taken out of her/his comfort zone. As I end my summer tennis season, I am facing the reality of serious knee degeneration. Truthfully, surgery may be my only option. The bad news is that I may need a whole knee replacement. even on hard courts. But, my ability to run has been severely limited. When faced with a deficiency in ones game, there are really only two options: Stay the course with your normal game, or adapt. I selected the latter this summer. I worked on being able to hit shorter shots that had lots of backspin which would require my opponent to move a bit forward into "no persons land." 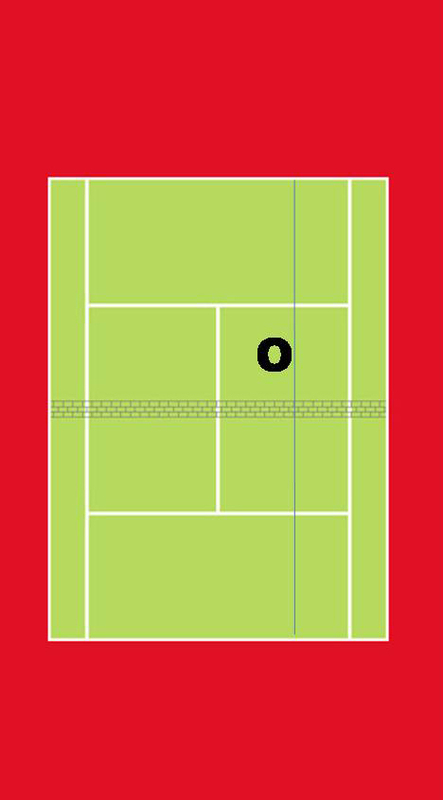 Frequently, the opponent would follow his reply into the net instead of remaining in this limbo area of the court or moving back to the baseline. In addition, I improved my drop shot. This naturally would bring the opponent to the net. By bringing my opponent to the net more often, I was able to prevent long baseline rallies where my running limitations and movement difficulties would put me in serious trouble. I discovered that there are many players out there who simply are not comfortable at the net. When asked to volley even a poor passing shot, these players would often times misplace and/or over hit the volley. In some instances, I discovered that the big "groundstroker" really couldnt volley at all. Well the above is not simply put forth as anecdotal information. Rather, I believe that the modern player, given the absence of great numbers of serve/volley competitors, should bring the opponent to the net more often. Whether you are intentionally bringing your opponent forward to volley, or finding that the surface enables the natural serve/volley player to shine, you need to develop good passing shots. Fortunately for me, passing shots have always been a strength in my game. Thus, my summer strategy worked because I could almost certainly win the point with a passing shot. The down-the-line, low to the net drive. Lets examine these options from a strategic point of view. 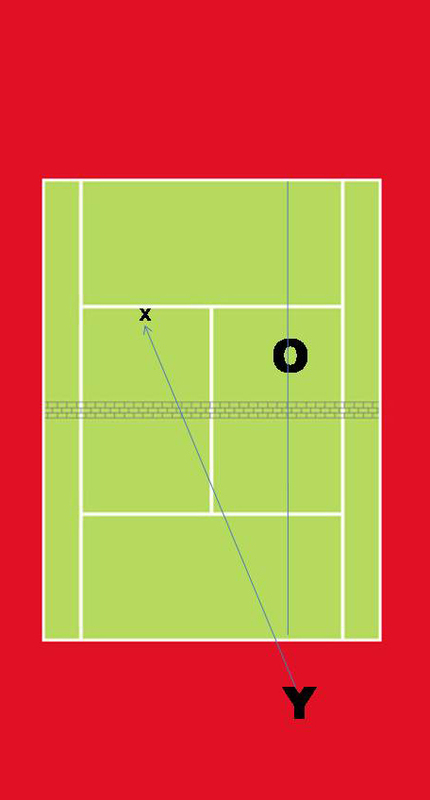 Below, you will find two diagrams that illustrate the proper situation for the down-the-line passing shot. 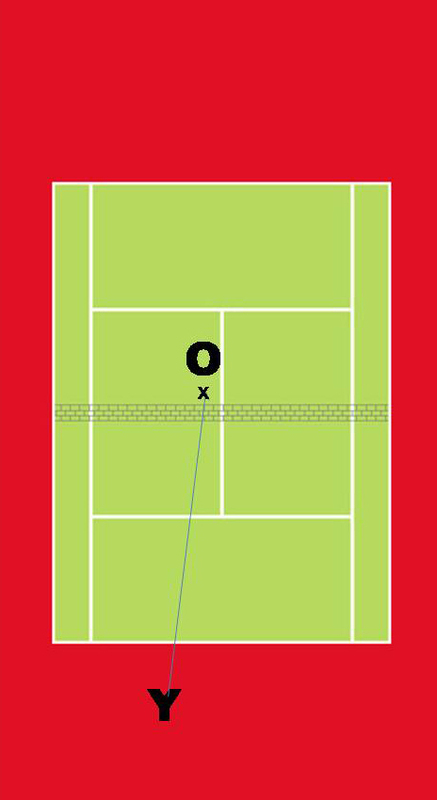 Please note that I have drawn a vertical line down the halves of the ad and deuce courts. 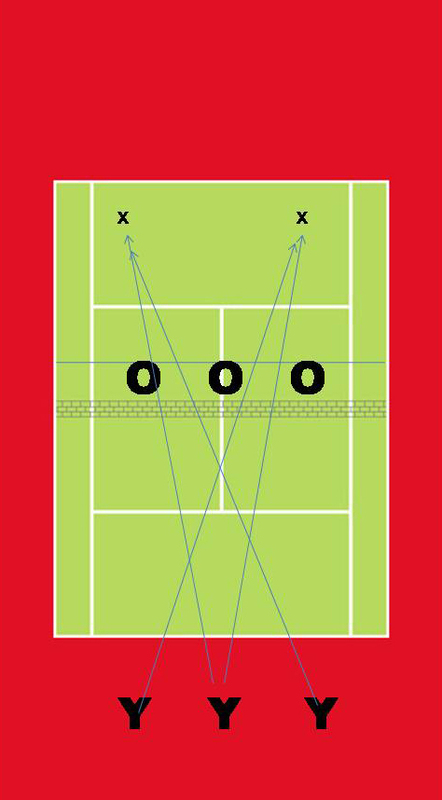 If your opponent is to the center of these lines, you are likely to have success hitting the down-the-line passing shot. 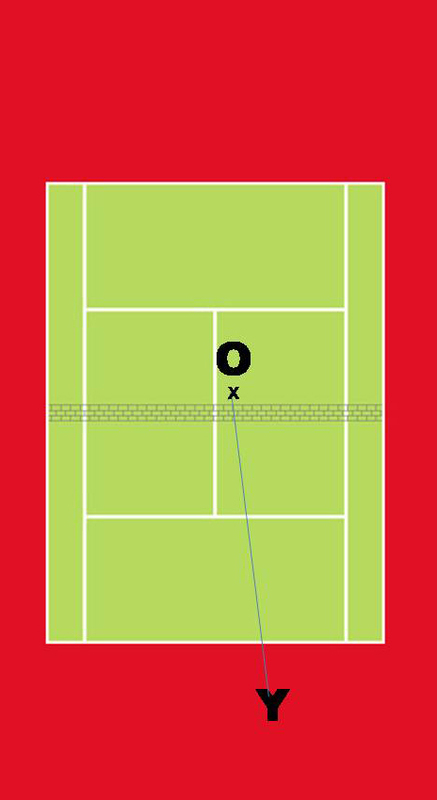 It is very important to remember that the down-the-line shot passes over the net at its highest point. 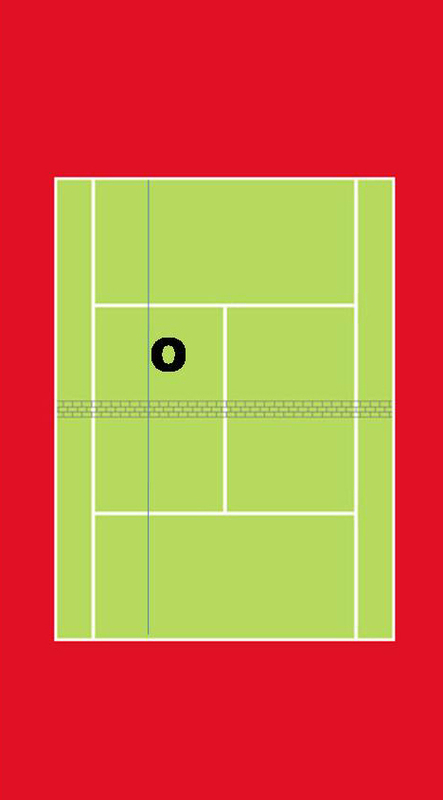 In addition, the court length is shorter than when hitting cross court. These passing shots require that you hit your shot with a little bit of net clearance (perhaps one of two feet) and with topspin. With these in mind, you can be certain that the ball will clear the net and land in bounds. Some players may have greater success hitting a slice passing shot that passes low to the net. If you are truly comfortable executing this shot, you will find that the opponent will have a more difficult time hitting an effective volley should he/she be able to place a racquet on your passing shot. The opponent, if she/he is savvy, will always try to cover for the down-the-line passing shot. It is the first choice of most players. In fact, during the 2007 U.S. Open, I took the time to chart passing shot frequency. My numbers indicate that about 70% of all passing shots were hit down-the-line. John McEnroe comments upon the fact that his Davis Cup Captain, Arthur Ashe, taught him to always cover the down-the-line passing shot. My numbers from the past Open indicate that Captain Ashe was sage in his advice. It is imperative that you practice this shot. Using a hitting partner or a ball machine, try hitting this passing shot while on the run. If you can hit these in, the stationary shots will be a breeze. The second type of passing shot is what I call the cross-court "roller." In this passing shot, you are hitting the ball cross court at a fairly sharp angle. Although you are passing the lower portion of the net, the sharper angle lessens your margin for error a bit. You should really simply "roll" this shot without too much pace put with plenty of topspin. Again, I have created diagrams that have the vertical lines. If your opponent is on one of these lines or close to the sidelines, you will probably be best electing to hit the cross-court roller. Again, you must practice this shot with a hitting partner or ball machine. Try to practice while on the run. If you can execute this passing shot well while running, the stationary passing shot will prove to be much easier. Many of us who attempt to volley are not as fleet of foot as we would like to be when closing the net. If one is a baseline player, this players side to side movement is probably better than forward movement. When an opponent is not really close to the net when hitting a volley, the at-the- feet "dipper" is a very good choice. attempting to put your shot at the opponents feet. The idea is to place the ball so that the opponent must hit a volley from a very low position. These are very difficult volleys to hit. It is unlikely that the opponents volley will be that effective. Usually, her/his volley will hit the net or will have little pace. In the latter case, the put away is usually not that difficult. However, some savvy players will actually hit a drop volley off the low ball. Usually, it is very difficult to get to these shots and hit a reply. If you opponent can execute this drop volley reply, you are probably wise not to attempt the "dipper" again. In the diagrams below, you will note that the opponent is near the service line. In reality, it is my experience that most recreational, high school and collegiate players do not close the net well. Thus when they are drawn to the net, their volleys are hit away from the net by quite a distance. Pros like Roger Federer are amazing! Roger can close the net extremely well. In addition, he can hit an effective volley even when he is not as close to the net as he would like. In looking at past footage of John McEnroe, it is safe to say that he had this same ability in his prime. Sometimes, an opponent will be very close to the net. This could be for one of several reasons. First if she/he is a true serve/volley player, it is not unlikely that she/he will be able to close the net better than most of us. if he/she is at all skilled. Unless the opponent is extremely tall and/has very good backward movement, the lobbed passing shot is an excellent choice. The keys to these passing shots are to always hit a topspin lob (so the opponent in moving back will have a more difficult time retrieving your lob), hit your lob with lots of altitude (to prevent the likelihood that the opponent will be able to hit an overhead smash, and to always place the lob in one of the two corners (permitting you the maximum margin for error). These lobbed passing shots are great, even if the opponent moves back and retrieves the ball. First, the opponent is running hard to get back to the ball, which increases fatigue. Second, it sends a message to the opponent: Closing the net too much will result in lobbed passing shots. Usually, the opponent will slow down her/his charge to the net, once you have hit an effective lobbed passing shot. In doing so, he/she will invariably be in a position that reduces the likelihood of hitting an easy volley. Below, you will see a diagram that identifies the hitting locations for lobbed passing shots. Passing shots are a critical part of ones game. Yet, we seldom work on these directly. At the major tennis academies (particularly those in Spain), you will see coaches working on running passing shots with their charges. These coaches realize the importance of having this weapon in a players arsenal. In presenting these four types of passing shots, I have presented them in the order in which they are most likely to occur. By this, I mean that the down-the-line passing shot is most common. The lobbed passing shot is least likely to be executed (except in doubles). Placing targets at the "x" locations identified in the above diagrams can be extremely helpful in practicing passing shots. One final piece of advice that is critical. When hitting a passing shot always freeze your head at the moment of contact, and for a full second after making contact. should the passing shot not elicit a reply. Hitting passing shots is a cerebral part of the game of tennis. Having to think while executing a point is not desirable. Thus, I stress the importance of practicing these passing shots so that they are instinctive. To all of you who read my column, I am certain that you are on the path to becoming a tennis overdog!